BUYING a home - Are you interested in buying a home in this neighborhood? Let Ward help you. Ward can set up an automatic alert to notify you as soon as any new listing comes on the market in this neighborhood. It is free, easy and automatic. Simply email Ward and let him know what you are looking for. SELLING a home - Are you thinking about selling soon? Do not settle for thousands less because you hired the wrong agent. To get the best price for your home, you need an experienced professional with a superior multi-media marketing plan. Experience and marketing matters! Contact Ward for a professional Market Analysis on your home. Your full-time neighborhood real estate professional. Let me help you. Put my Experience, Knowledge and Professional Marketing to work for you. Data source: Arizona Regional Multiple Listing Service (ARMLS). Data as of 11-5-2018. Information subject to change. All information should be verified by the recipient and none is guaranteed as accurate by Ward Stone or ARMLS. 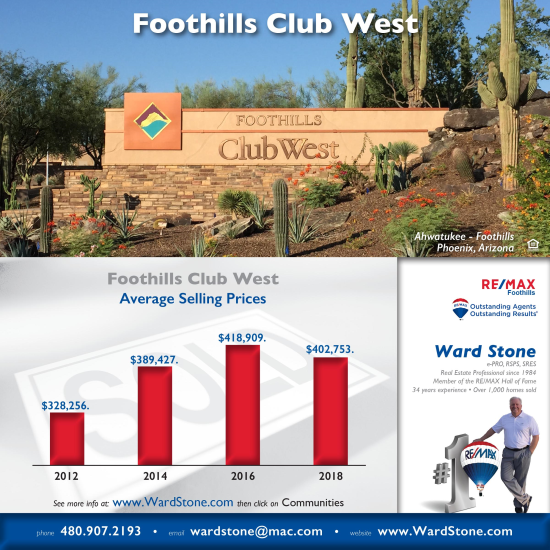 Ward Stone is a full-time real estate professional serving this neighborhood. He is not affiliated with the Homeowner's Association.